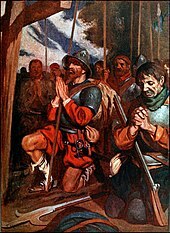 This article is about the Spanish and Portuguese explorer-soldiers from the 15th to 17th centuries. For other uses, see Conquistador (disambiguation). Conquistador (/kɒnˈkɪstədɔːr/; from Spanish or Portuguese conquistador "conqueror"; Spanish: [koŋkistaˈðoɾes], Portuguese: [kũkiʃtɐˈdoɾis, kõkiʃtɐˈðoɾɨʃ]) is a term widely used to refer to the knights, soldiers and explorers of the Spanish Empire and the Portuguese Empire. During the Age of Discovery, conquistadors sailed beyond Europe to the Americas, Oceania, Africa, and Asia, conquering territory and opening trade routes. They colonized much of the world for Spain and Portugal in the 16th, 17th, and 18th centuries. After Columbus's discovery of the West Indies in 1492, the Spanish conquistadors, who were primarily poor nobles from the impoverished west and south of Spain, began building up an American empire in the Caribbean, using islands such as Cuba, Puerto Rico, and Hispaniola as bases. Florida fell to Juan Ponce de León after 1513. From 1519 to 1521, Hernán Cortés waged a campaign against the Aztec Empire, ruled by Moctezuma II. From the territories of the Aztec Empire conquistadors expanded Spanish rule to northern Central America and parts of what is now southern and western United States. Other conquistadors took over the Inca Empire after crossing the Isthmus of Panama and sailing the Pacific to northern Peru. As Francisco Pizarro subdued the empire in a manner similar to Cortés other conquistadores used Peru as base for conquering much of Ecuador and Chile. In Colombia, Bolivia, and Argentina conquistadors from Peru linked up with other conquistadors arriving more directly from the Caribbean and Río de la Plata-Paraguay respectively. Conquistadors founded numerous cities many of them on locations with pre-existing pre-colonial settlements including the capitals of most Latin American countries. Besides conquests, Spanish conquistadors made significant explorations into the Amazon Jungle, Patagonia, the interior of North America, and the Pacific Ocean. Portugal established a route to China in the early 16th century, sending ships via the southern coast of Africa and founding numerous coastal enclaves along the route. Following the discovery in 1492 by Spaniards of the New World with Christopher Columbus's first voyage there and the first circumnavigation of the world by Ferdinand Magellan and Juan Sebastián Elcano in 1521, expeditions led by conquistadors in the 16th century established trading routes linking Europe with all these areas. Human infections gained worldwide transmission vectors for the first time: from Africa and Eurasia to the Americas and vice versa. The spread of old-world diseases, including smallpox, flu and typhus, led to the deaths of many indigenous inhabitants of the New World. In the 16th century perhaps 240,000 Europeans entered American ports. By the late 16th century gold and silver imports from America provided one-fifth of Spain's total budget. Hernando de Soto and Spanish conquistadors seeing the Mississippi River for the first time. The conquistadors were professional warriors, using European tactics, firearms, and cavalry. Their units (compañia, companhia) would often specialize in forms of combat that required long periods of training that were too costly for informal groups. Their armies were mostly composed of Iberian and other European soldiers. Native allied troops were largely infantry equipped with armament and armour that varied geographically. Some groups consisted of young men without military experience, Catholic clergy which helped with administrative duties, and soldiers with military training. These native forces often included African slaves and Native Americans. They not only fought in the battlefield but served as interpreters, informants, servants, teachers, physicians, and scribes. India Catalina and Malintzin were Native American women slaves who worked for the Spaniards. 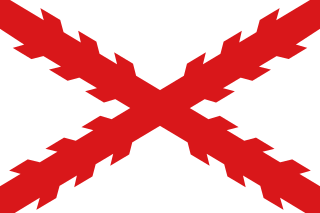 Castilian law prohibited foreigners and non-Catholics from settling in the New World. However, not all conquistadors were Castilian. Many foreigners Hispanicised their names and/or converted to Catholicism to serve the Castilian Crown. For example, Ioánnis Fokás (known as Juan de Fuca) was a Castilian of Greek origin who discovered the strait that bears his name between Vancouver Island and Washington State in 1592. German-born Nikolaus Federmann, Hispanicised as Nicolás de Federmán, was a conquistador in Venezuela and Colombia. The Venetian Sebastiano Caboto was Sebastián Caboto, Georg von Speyer Hispanicised as Jorge de la Espira, Eusebio Francesco Chini Hispanicised as Eusebio Kino, Wenceslaus Linck was Wenceslao Linck, Ferdinand Konščak, was Fernando Consag, Amerigo Vespucci was Américo Vespucio, and the Portuguese Aleixo Garcia was known as Alejo García in the Castilian army. The origin of many people in mixed expeditions was not always distinguished. Various occupations, such as sailors, fishermen, soldiers and nobles employed different languages (even from unrelated language groups), so that crew and settlers of Iberian empires recorded as Galicians from Spain were actually using Portuguese, Basque, Catalan, Italian and Languedoc languages, which were wrongly identified. Castilian law banned Spanish women from travelling to America unless they were married and accompanied by a husband. Women who travelled thus include María de Escobar, María Estrada, Marina Vélez de Ortega, Marina de la Caballería, Francisca de Valenzuela, Catalina de Salazar. Some conquistadors married Native American women or had illegitimate children. European young men enlisted in the army because it was one way out of poverty. Catholic priests instructed the soldiers in mathematics, writing, theology, Latin, Greek, and history, and wrote letters and official documents for them. King's army officers taught military arts. An uneducated young recruit could become a military leader, elected by their fellow professional soldiers, perhaps based on merit. Others were born into hidalgo families, and as such they were members of the Spanish nobility with some studies but without economic resources. Even some rich nobility families' members became soldiers or missionaries, but mostly not the firstborn heirs. The two most famous conquistadors were Hernán Cortés who conquered the Aztec Empire and Francisco Pizarro who led the conquest of the Incan Empire. They were second cousins born in Extremadura, where many of the Spanish conquerors were born. Catholic religious orders that participated and supported the exploration, evangelizing and pacifying, were mostly Dominicans, Carmelites, Franciscans and Jesuits, for example Francis Xavier, Bartolomé de Las Casas, Eusebio Kino, Juan de Palafox y Mendoza or Gaspar da Cruz. In 1536, Dominican friar Bartolomé de las Casas went to Oaxaca to participate in a series of discussions and debates among the Bishops of the Dominican and Franciscan orders. The two orders had very different approaches to the conversion of the Indians. The Franciscans used a method of mass conversion, sometimes baptizing many thousands of Indians in a day. This method was championed by prominent Franciscans such as Toribio de Benavente. The conquistadors took many different roles, including religious leader, harem keeper, King or Emperor, deserter and Native American warrior. Caramuru was a Portuguese settler in the Tupinambá Indians. Gonzalo Guerrero was a Mayan war leader for Nachan can, Lord of Chactemal. Gerónimo de Aguilar, who had taken holy orders in his native Spain was captured by Mayan lords too, and later was a soldier with Hernán Cortés. Francisco Pizarro had children with more than 40 women. The chroniclers Pedro Cieza de León, Gonzalo Fernández de Oviedo, Diego Durán, Juan de Castellanos and friar Pedro Simón wrote about the Americas. After Mexico fell, Hernán Cortés's enemies, Bishop Fonseca, Diego Velázquez de Cuéllar, Diego Columbus and Francisco Garay were mentioned in the Cortés' fourth letter to the King in which he describes himself as the victim of a conspiracy. The division of the booty produced bloody conflicts, such as the one between Pizarro and De Almagro. 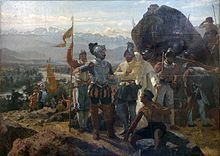 After present-day Peruvian territories fell to Spain, Francisco Pizarro dispatched El Adelantado, Diego de Almagro, before they became enemies to the Inca Empire's northern city of Quito to claim it. Their fellow conquistador Sebastián de Belalcázar, who had gone forth without Pizarro's approval, had already reached Quito. The arrival of Pedro de Alvarado from the lands known today as Mexico in search of Inca gold further complicated the situation for De Almagro and Belalcázar. De Alvarado left South America in exchange for monetary compensation from Pizarro. De Almagro was executed in 1538, by Hernándo Pizarro's orders. In 1541 Lima, supporters of Diego Almagro II assassinated Francisco Pizarro. In 1546, De Belalcázar ordered the execution of Jorge Robledo, who governed a neighbouring province in yet another land-related vendetta. De Belalcázar was tried in absentia, convicted and condemned for killing Robledo and other offenses pertaining to his involvement in the wars between armies of conquistadors. Pedro de Ursúa was killed by his subordinate Lope de Aguirre who crowned himself king while searching for El Dorado. In 1544, Lope de Aguirre and Melchor Verdugo (a converso Jew) were at the side of Peru's first viceroy Blasco Núñez Vela, who had arrived from Spain with orders to implement the New Laws and suppress the encomiendas. Gonzalo Pizarro, another brother of Francisco Pizarro, rose in revolt, killed viceroy Blasco Núñez Vela and most of his Spanish army in the battle in 1546, and Gonzalo attempted to have himself crowned king. 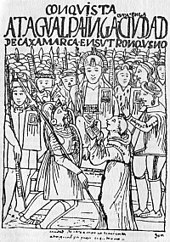 Hernán Cortés and his counsellor, the Indian woman La Malinche meet Moctezuma II in Tenochtitlan, 8 November 1519. 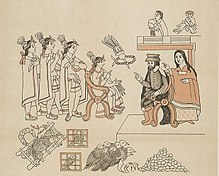 Facsimile (c. 1890) of Lienzo de Tlaxcala. Infante Dom Henry the Navigator of Portugal, son of King João I, became the main sponsor of exploration travels. In 1415, Portugal conquered Ceuta, its first overseas colony. Throughout the 15th century, Portuguese explorers sailed the coast of Africa, establishing trading posts for tradable commodities such as firearms, spices, silver, gold, and slaves crossing Africa and India. In 1434 the first consignment of slaves was brought to Lisbon; slave trading was the most profitable branch of Portuguese commerce until the Indian subcontinent was reached. After his father's death in 1479, Ferdinand II of Aragón unified Castile with Aragón, creating the Kingdom of Spain. He later tried to incorporate by marriage the kingdom of Portugal. Ferdinand notably supported Columbus's first voyage that launched the conquistadors into action. The 1492 discovery of the New World by Spain rendered desirable a delimitation of the Spanish and Portuguese spheres of exploration. Thus dividing the world into two exploration and colonizing areas seemed appropriate. This was accomplished by the Treaty of Tordesillas (7 June 1494) which modified the delimitation authorized by Pope Alexander VI in two bulls issued on 4 May 1493. The treaty gave to Portugal all lands which might be discovered east of a meridian drawn from the Arctic Pole to the Antarctic, at a distance of 370 leagues (1,800 km) west of Cape Verde. Spain received the lands west of this line. The known means of measuring longitude were so inexact that the line of demarcation could not in practice be determined, subjecting the treaty to diverse interpretations. Both the Portuguese claim to Brazil and the Spanish claim to the Moluccas (see East Indies#History) depended on the treaty. It was particularly valuable to the Portuguese as a recognition of their new-found,[clarification needed] particularly when, in 1497–1499, Vasco da Gama completed the voyage to India. Later, when Spain established a route to the Indies from the west, Portugal arranged a second treaty, the Treaty of Zaragoza. Sevilla la Nueva, established in 1509, was the first Spanish settlement on the island of Jamaica, which the Spaniards called Isla de Santiago. The capital was in an unhealthy location and consequently moved around 1534 to the place they called "Villa de Santiago de la Vega", later named Spanish Town, in present-day Saint Catherine Parish. After first landing on Guanahani island in The Bahamas, Columbus found the island which he called Isla Juana, later named Cuba. In 1511, the first Adelantado of Cuba, Diego Velázquez de Cuéllar founded the island's first Spanish settlement at Baracoa; other towns soon followed, including Havana, which was founded in 1515. After he pacified Hispaniola, where the native Indians had revolted against the administration of governor Nicolás de Ovando, Diego Velázquez de Cuéllar led the conquest of Cuba in 1511 under orders from Viceroy Diego Columbus and was appointed governor of the island. 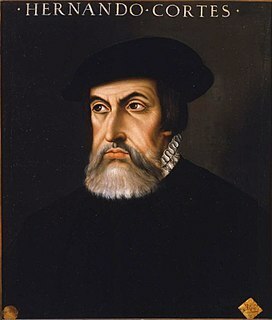 As governor he authorized expeditions to explore lands further west, including the 1517 Francisco Hernández de Córdoba expedition to Yucatán. Diego Velázquez, ordered expeditions, one led by his nephew, Juan de Grijalva, to Yucatán and the Hernán Cortés expedition of 1519. He initially backed Cortés's expedition to Mexico, but because of his personal enmity for Cortés later ordered Pánfilo de Narváez to arrest him. Grijalva was sent out with four ships and some 240 men. Hernán Cortés, led an expedition (entrada) to Mexico, which included Pedro de Alvarado, and Bernardino Vázquez de Tapia. The Spanish campaign against the Aztec Empire had its final victory on August 13, 1521, when a coalition army of Spanish forces and native Tlaxcalan warriors led by Cortés and Xicotencatl the Younger captured the emperor Cuauhtemoc and Tenochtitlan, the capital of the Aztec Empire. The fall of Tenochtitlan marks the beginning of Spanish rule in central Mexico, and they established their capital of Mexico City on the ruins of Tenochtitlan. The Spanish conquest of the Aztec Empire was one of the most significant and complex events in world history. In 1516 Juan Díaz de Solís, discovered the estuary formed by the confluence of the Uruguay River and the Paraná River. In 1517 Francisco Hernández de Córdoba sailed from Cuba in search of slaves along the coast of Yucatán. The expedition returned to Cuba to report on the discovery of this new land. After receiving notice from Juan de Grijalva of gold in the area of what is now Tabasco, the governor of Cuba, Diego de Velasquez, sent a larger force than had previously sailed, and appointed Cortes as Captain-General of the Armada. Cortes then applied all of his funds, mortgaged his estates and borrowed from merchants and friends to outfit his ships. Velasquez may have contributed to the effort, but the government of Spain offered no financial support. Pedro Arias Dávila, Governor of the Island La Española was descended from a converso's family. In 1519 Dávila founded Darién, then in 1524 he founded Panama City and moved his capital there laying the basis for the exploration of South America's west coast and the subsequent conquest of Peru. Dávila was a soldier in wars against Moors at Granada in Spain, and in North Africa, under Pedro Navarro intervening in the Conquest of Oran. At the age of nearly seventy years he was made commander in 1514 by Ferdinand of the largest Spanish expedition. Dávila sent Gil González Dávila to explore northward, and Pedro de Alvarado to explore Guatemala. In 1524 he sent another expedition with Francisco Hernández de Córdoba, executed there in 1526 by Dávila, by then aged over 85. Dávila's daughters married Rodrigo de Contreras and conquistador of Florida and Mississippi, the Governor of Cuba Hernando de Soto. Dávila made an agreement with Francisco Pizarro and Diego de Almagro, which brought about the discovery of Peru, but withdrew in 1526 for a small compensation, having lost confidence in the outcome. In 1526 Dávila was superseded as Governor of Panama by Pedro de los Ríos, but became governor in 1527 of León in Nicaragua. An expedition commanded by Pizarro and his brothers explored south from what is today Panama, reaching Inca territory by 1526. After one more expedition in 1529, Pizarro received royal approval to conquer the region and be its viceroy. The approval read: "In July 1529 the queen of Spain signed a charter allowing Pizarro to conquer the Incas. Pizarro was named governor and captain of all conquests in New Castile" The Viceroyalty of Peru was established in 1542, encompassing all Spanish holdings in South America. Juan Díaz de Solís arrived again to the renamed Río de la Plata, literally river of the silver, after the Incan conquest. He sought a way to transport the Potosi's silver to Europe. For a long time due to the Incan silver mines, Potosí was the most important site in Colonial Spanish America, located in the current department of Potosí in Bolivia and it was the location of the Spanish colonial mint. The first settlement in the way was the fort of Sancti Spiritu, established in 1527 next to the Paraná River. Buenos Aires was established in 1536, establishing the Governorate of the Río de la Plata. Africans were also conquistadors in the early Conquest campaigns in the Caribbean and Mexico. In the 1500s there were enslaved black, free black, and free black sailors on Spanish ships crossing the Atlantic and developing new routes of conquest and trade in the Americas. 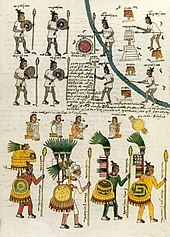 After 1521, the wealth and credit generated by the acquisition of the Mexica Empire funded auxiliary forces of black conquistadors that could number as many as five hundred. Spaniards recognized the value of these fighters. Although they usually chose to forget black contributions in written accounts of Spanish campaigns, Spaniards occasionally admitted that African men were outstanding soldiers (because so many African men became slaves by being captured on battlefields back in Africa, they already had military experience before coming to the Americas). One of the black conquistadors who fought against the Aztecs and survived the destruction of their empire was Juan Garrido. Born in Africa, Garrido lived as a young slave in Portugal before being sold to a Spaniard and acquiring his freedom fighting in the conquests of Puerto Rico, Cuba, and other islands. 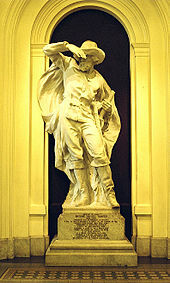 He fought in the Spanish–American War as a free servant or auxiliary, participating in Spanish expeditions to other parts of Mexico (including Baja California) in the 1520s and 1530s. Granted a house plot in Mexico City, he raised a family there, working at times as a guard and town crier. He claimed to have been the first person to plant wheat in Mexico. Sebastian Toral was an African slave and one of the first black conquistadors in the New World. While a slave, he went with his Spanish owner on a campaign. He was able to earn his freedom during this service. He continued as a free conquistador with the Spaniards to fight the Mayas in Yucatán in 1540. After the conquests he settled in the city of Mérida in the newly formed colony of Yucatán with his family. In 1574, the Spanish crown ordered that all slaves and free blacks in the colony had to pay a tribute to the crown. However, Toral wrote in protest of the tax based on his services during his conquests. The Spanish king responded that Toral need not pay the tax because of his service. Toral died a veteran of three transatlantic voyages and two Conquest expeditions, a man who had successfully petitioned the great Spanish King, walked the streets of Lisbon, Seville, and Mexico City, and helped found a capital city in the Americas. Juan Valiente was born West Africa and purchased by Portuguese traders from African slavers. Around 1530 he was purchased by Alonso Valiente to be a slaved domestic servant in Puebla, Mexico. In 1533 Juan Valiente made a deal with his owner to allow him to be a conquistador for four years with the agreement that all earnings would come back to Alonso. He fought for many years in Chile and Peru. By 1540 he was a captain, horseman, and partner in Juan de Valdivia's company in Chile. He was later awarded an estate in Santiago; a city he would help Valdivia found. Both Alonso and Valiente tried to contact the other to make an agreement about Valiente's manumision and send Alonso his awarded money. They were never able to reach each other and Valiente died in 1553 in the Battle of Tucapel. Other black conquistadors include Pedro Fulupo, Juan Bardales, Antonio Perez, and Juan Portugues. Pedro Fulupo was a black slave that fought in Costa Rica. Juan Bardales was an African slave that fought in Honduras and Panama. For is service he was granted manumission and a pension of 50-peso. Antonio Perez was from North Africa and a free black. He joined the conquest in Venezuela and was made a captain. Juan Portugues fought in the conquests in Venezuela. The conquistador Juan Ponce de León (Santervás de Campos, Valladolid, Spain). He was the first European to arrive at the current U.S. and led the first European expedition to Florida, which he named. 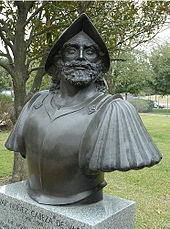 Monument to Cabeza de Vaca in Houston, Texas. During the 1500s, the Spanish began to travel through and colonize North America. They were looking for gold in foreign kingdoms. By 1511 there were rumours of undiscovered lands to the northwest of Hispaniola. Juan Ponce de León equipped three ships with at least 200 men at his own expense and set out from Puerto Rico on 4 March 1513 to Florida and surrounding coastal area. Another early motive was the search for the Seven Cities of Gold, or "Cibola", rumoured to have been built by Native Americans somewhere in the desert Southwest. In 1536 Francisco de Ulloa, the first documented European to reach the Colorado River, sailed up the Gulf of California and a short distance into the river's delta. The Basques were fur trading, fishing cod and whaling in Terranova (Labrador and Newfoundland) in 1520, and in Iceland by at least the early 17th century. 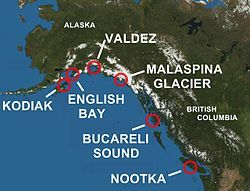 They established whaling stations at the former, mainly in Red Bay, and probably established some in the latter as well. In Terranova they hunted bowheads and right whales, while in Iceland they appear to have only hunted the latter. The Spanish fishery in Terranova declined over conflicts between Spain and other European powers during the late 16th and early 17th centuries. In 1524 the Portuguese Estevão Gomes, who had sailed in Ferdinand Magellan's fleet, explored Nova Scotia, sailing South through Maine, where he entered New York Harbor and the Hudson River and eventually reached Florida in August 1525. 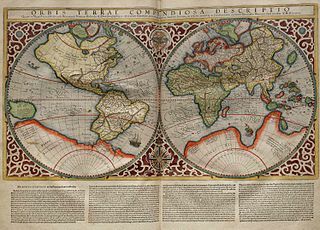 As a result of his expedition, the 1529 Diego Ribeiro world map outlined the East coast of North America almost perfectly. In 1534 the explorer French Jacques Cartier described and mapped the Gulf of Saint Lawrence and the shores of the Saint Lawrence River. 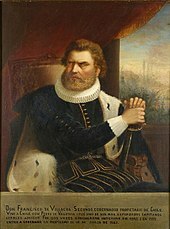 The Spaniard Cabeza de Vaca was the leader of the Narváez expedition of 600 men that between 1527 and 1535 explored the mainland of North America. From Tampa Bay, Florida, on 15 April 1528, they marched through Florida. Traveling mostly on foot, they crossed Texas, New Mexico and Arizona, and Mexican states of Tamaulipas, Nuevo León and Coahuila. After several months of fighting native inhabitants through wilderness and swamp, the party reached Apalachee Bay with 242 men. They believed they were near other Spaniards in Mexico, but there was in fact 1500 miles of coast between them. They followed the coast westward, until they reached the mouth of the Mississippi River near to Galveston Island. Later they were enslaved for a few years by various Native American tribes of the upper Gulf Coast. They continued through Coahuila and Nueva Vizcaya; then down the Gulf of California coast to what is now Sinaloa, Mexico, over a period of roughly eight years. They spent years enslaved by the Ananarivo of the Louisiana Gulf Islands. Later they were enslaved by the Hans, the Capoques and others. In 1534 they escaped into the American interior, contacting other Native American tribes along the way. Only four men, Cabeza de Vaca, Andrés Dorantes de Carranza, Alonso del Castillo Maldonado, and an enslaved Moroccan Berber named Estevanico, survived and escaped to reach Mexico City. 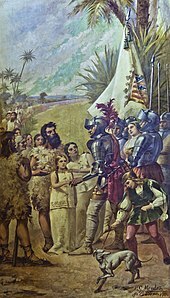 In 1539, Estevanico was one of four men who accompanied Marcos de Niza as a guide in search of the fabled Seven Cities of Cibola, preceding Coronado. When the others were struck ill, Estevanico continued alone, opening up what is now New Mexico and Arizona. He was killed at the Zuni village of Hawikuh in present-day New Mexico. The viceroy of New Spain Antonio de Mendoza, for whom is named the Codex Mendoza, commissioned several expeditions to explore and establish settlements in the northern lands of New Spain in 1540–42. Francisco Vázquez de Coronado reached Quivira in central Kansas. Juan Rodríguez Cabrillo explored the western coastline of Alta California in 1542–43. Francisco Vázquez de Coronado's 1540–1542 expedition began as a search for the fabled Cities of Gold, but after learning from natives in New Mexico of a large river to the west, he sent García López de Cárdenas to lead a small contingent to find it. With the guidance of Hopi Indians, Cárdenas and his men became the first outsiders to see the Grand Canyon. However, Cárdenas was reportedly unimpressed with the canyon, assuming the width of the Colorado River at six feet (1.8 m) and estimating 300-foot-tall (91 m) rock formations to be the size of a man. After unsuccessfully attempting to descend to the river, they left the area, defeated by the difficult terrain and torrid weather. In 1540, Hernando de Alarcón and his fleet reached the mouth of the Colorado River, intending to provide additional supplies to Coronado's expedition. Alarcón may have sailed the Colorado as far upstream as the present-day California–Arizona border. However, Coronado never reached the Gulf of California, and Alarcón eventually gave up and left. Melchior Díaz reached the delta in the same year, intending to establish contact with Alarcón, but the latter was already gone by the time of Díaz's arrival. Díaz named the Colorado River Rio del Tizon, while the name Colorado ("Red River") was first applied to a tributary of the Gila River. In 1540, expeditions under Hernando de Alarcon and Melchior Diaz visited the area of Yuma and immediately saw the natural crossing of the Colorado River from Mexico to California by land as an ideal spot for a city, as the Colorado River narrows to slightly under 1000 feet wide in one small point. Later military expeditions that crossed the Colorado River at the Yuma Crossing include Juan Bautista de Anza (1774). The marriage between Luisa de Abrego, a free black domestic servant from Seville and Miguel Rodríguez, a white Segovian conquistador in 1565 in St. Augustine (Spanish Florida), is the first known and recorded Christian marriage anywhere in the continental United States. The Chamuscado and Rodriguez Expedition explored New Mexico in 1581–1582. They explored a part of the route visited by Coronado in New Mexico and other parts in the southwestern United States between 1540 and 1542. The viceroy of New Spain Don Diego García Sarmiento sent another expedition in 1648 to explore, conquer and colonize the Californias. In 1525 Charles I of Spain ordered an expedition led by friar García Jofre de Loaísa to go to Asia by the western route to colonize the Maluku Islands (known as Spice Islands, now part of Indonesia), thus crossing first the Atlantic and then the Pacific oceans. 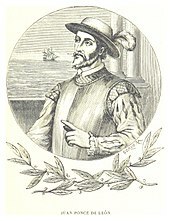 Ruy López de Villalobos sailed to the Philippines in 1542–43. From 1546 to 1547 Francis Xavier worked in Maluku among the peoples of Ambon Island, Ternate, and Morotai, and laid the foundations for the Christian religion there. In 1564, Miguel López de Legazpi was commissioned by the viceroy of New Spain, Luis de Velasco, to explore the Maluku Islands where Magellan and Ruy López de Villalobos had landed in 1521 and 1543, respectively. 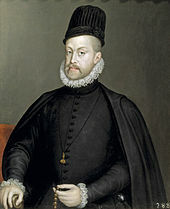 The expedition was ordered by Philip II of Spain, after whom the Philippines had earlier been named by Villalobos. El Adelantado Legazpi established settlements in the East Indies and the Pacific Islands in 1565. He was the first governor-general of the Spanish East Indies. After obtaining peace with various indigenous tribes, López de Legazpi made the Philippines the capital[clarification needed] in 1571. The Spanish settled and took control of Tidore in 1603 to trade spices and counter Dutch encroachment in the archipelago of Maluku. The Spanish presence lasted until 1663, when the settlers and military were moved back to the Philippines. Part of the Ternatean population chose to leave with the Spanish, settling near Manila in what later became the municipality of Ternate. Spanish galleons travelled across the Pacific Ocean between Acapulco in Mexico and Manila. In 1542, Juan Rodríguez Cabrillo traversed the coast of California and named many of its features. In 1601, Sebastián Vizcaíno mapped the coastline in detail and gave new names to many features. Martín de Aguilar, lost from the expedition led by Sebastián Vizcaíno, explored the Pacific coast as far north as Coos Bay in present-day Oregon. Since the 1549 arrival to Kagoshima (Kyushu) of a group of Jesuits with St. Francis Xavier missionary and Portuguese traders, Spain was interested in Japan. In this first group of Jesuit missionaries were included Spaniards Cosme de Torres and Juan Fernandez. In 1611, Sebastián Vizcaíno surveyed the east coast of Japan and from the year of 1611 to 1614 he was ambassador of King Felipe III in Japan returning to Acapulco in the year of 1614. In 1608, he was sent to search for two mythical islands called Rico de Oro (island of gold) and Rico de Plata (island of silver). As a seafaring people in the south-westernmost region of Europe, the Portuguese became natural leaders of exploration during the Middle Ages. Faced with the options of either accessing other European markets by sea, by exploiting its seafaring prowess, or by land, and facing the task of crossing Castile and Aragon territory, it is not surprising that goods were sent via the sea to England, Flanders, Italy and the Hanseatic league towns. One important reason was the need for alternatives to the expensive eastern trade routes that followed the Silk Road. Those routes were dominated first by the republics of Venice and Genoa, and then by the Ottoman Empire after the conquest of Constantinople in 1453. The Ottomans barred European access. For decades the Spanish Netherlands ports produced more revenue than the colonies since all goods brought from Spain, Mediterranean possessions, and the colonies were sold directly there to neighbouring European countries: wheat, olive oil, wine, silver, spice, wool and silk were big businesses. The gold brought home from Guinea stimulated the commercial energy of the Portuguese, and its European neighbours, especially Spain. Apart from their religious and scientific aspects, these voyages of discovery were highly profitable. They had benefited from Guinea's connections with neighbouring Iberians and north African Muslim states. Due to these connections, mathematicians and experts in naval technology appeared in Portugal. Portuguese and foreign experts made several breakthroughs in the fields of mathematics, cartography and naval technology. Under Afonso V (1443–1481), surnamed the African, the Gulf of Guinea was explored as far as Cape St Catherine (Cabo Santa Caterina), and three expeditions in 1458, 1461 and 1471, were sent to Morocco; in 1471 Arzila (Asila) and Tangier were captured from the Moors. Portuguese explored the Atlantic, Indian and Pacific oceans before the Iberian Union period (1580–1640). Under John II (1481–1495) the fortress of São Jorge da Mina, the modern Elmina, was founded for the protection of the Guinea trade. Diogo Cão, or Can, discovered the Congo in 1482 and reached Cape Cross in 1486. In 1483 Diogo Cão sailed up the uncharted Congo River, finding Kongo villages and becoming the first European to encounter the Kongo kingdom. On 7 May 1487, two Portuguese envoys, Pêro da Covilhã and Afonso de Paiva, were sent traveling secretly overland to gather information on a possible sea route to India, but also to inquire about Prester John. Covilhã managed to reach Ethiopia. Although well received, he was forbidden to depart. Bartolomeu Dias crossed the Cape of Good Hope in 1488, thus proving that the Indian Ocean was accessible by sea. In 1498, Vasco da Gama reached India. In 1500, Pedro Álvares Cabral discovered Brazil, claiming it for Portugal. In 1510, Afonso de Albuquerque conquered Goa in India, Ormuz in the Persian Strait, and Malacca. The Portuguese sailors sailed eastward to such places as Taiwan, Japan, and the island of Timor. Several writers have also suggested the Portuguese were the first Europeans to discover Australia and New Zealand. Álvaro Caminha, in Cape Verde islands, who received the land as a grant from the crown, established a colony with Jews forced to stay on São Tomé Island. Príncipe island was settled in 1500 under a similar arrangement. Attracting settlers proved difficult; however, the Jewish settlement was a success and their descendants settled many parts of Brazil. From their peaceful settlings in secured islands along Atlantic Ocean (archipelagos and islands as Madeira, Açores, Cape Verde, Sao Tome, Principe, and Annobon) they travelled to coastal enclaves trading almost every goods of African and Islander areas like spices (hemp, opium, garlic), wine, dry fish, dried meat, toasted flour, leather, fur of tropical animals and seals, whaling ... but mainly ivory, black slaves, gold and hardwoods. They maintaining trade ports in Congo (M'banza), Angola, Natal (City of Cape Good Hope, in Portuguese "Cidade do Cabo da Boa Esperança"), Mozambique (Sofala), Tanzania (Kilwa Kisiwani), Kenya (Malindi) to Somalia. The Portuguese following the maritime trade routes of Muslims and Chinese traders, sailed the Indian Ocean. They were on Malabar Coast since 1498 when Vasco da Gama reached Anjadir, Kannut, Kochi and Calicut. Da Gama in 1498 marked the beginning of Portuguese influence in Indian Ocean. In 1503 or 1504, Zanzibar became part of the Portuguese Empire when Captain Ruy Lourenço Ravasco Marques landed and demanded and received tribute from the sultan in exchange for peace. :page: 99 Zanzibar remained a possession of Portugal for almost two centuries. It initially became part of the Portuguese province of Arabia and Ethiopia and was administered by a governor general. Around 1571, Zanzibar became part of the western division of the Portuguese empire and was administered from Mozambique. :page: 15 It appears, however, that the Portuguese did not closely administer Zanzibar. The first English ship to visit Unguja, the Edward Bonaventure in 1591, found that there was no Portuguese fort or garrison. The extent of their occupation was a trade depot where produce was purchased and collected for shipment to Mozambique. "In other respects, the affairs of the island were managed by the local 'king,' the predecessor of the Mwinyi Mkuu of Dunga. ":page: 81 This hands-off approach ended when Portugal established a fort on Pemba around 1635 in response to the Sultan of Mombasa's slaughter of Portuguese residents several years earlier. In west Africa Cidade de Congo de São Salvador was founded some time after the arrival of the Portuguese, in the pre-existing capital of the local dynasty ruling at that time (1483), in a city of the Luezi River valley. 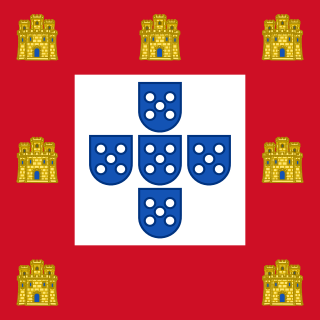 Portuguese were established supporting one Christian local dynasty ruling suitor. When Afonso I of Kongo was established the Roman Catholic Church in Kongo kingdom. By 1516 Afonso I sent various of his children and nobles to Europe to study, including his son Henrique Kinu a Mvemba, who was elevated to the status of bishop in 1518. Afonso I wrote a series of letters to the kings of Portugal Manuel I and João III of Portugal concerning to the behavior of the Portuguese in his country and their role in the developing slave trade, complaining of Portuguese complicity in purchasing illegally enslaved people and the connections between Afonso's men, Portuguese mercenaries in Kongo's service and the capture and sale of slaves by Portuguese. The aggregate of Portugal's colonial holdings in India were Portuguese India. The period of European contact of Ceylon began with the arrival of Portuguese soldiers and explorers of the expedition of Lourenço de Almeida, the son of Francisco de Almeida, in 1505. The Portuguese founded a fort at the port city of Colombo in 1517 and gradually extended their control over the coastal areas and inland. In a series of military conflicts, political manoeuvres and conquests, the Portuguese extended their control over the Sinhalese kingdoms, including Jaffna (1591), Raigama (1593), Sitawaka (1593), and Kotte (1594,) but the aim of unifying the entire island under Portuguese control failed. The Portuguese, led by Pedro Lopes de Sousa, launched a full-scale military invasion of the Kingdom of Kandy in the Campaign of Danture of 1594. The invasion was a disaster for the Portuguese, with their entire army wiped out by Kandyan guerilla warfare. More envoys were sent in 1507 to Ethiopia, after Socotra was taken by the Portuguese. As a result of this mission, and facing Muslim expansion, regent queen Eleni of Ethiopia sent ambassador Mateus to king Manuel I of Portugal and to the Pope, in search of a coalition. Mateus reached Portugal via Goa, having returned with a Portuguese embassy, along with priest Francisco Álvares in 1520. Francisco Álvares book, which included the testimony of Covilhã, the Verdadeira Informação das Terras do Preste João das Indias ("A True Relation of the Lands of Prester John of the Indies") was the first direct account of Ethiopia, greatly increasing European knowledge at the time, as it was presented to the pope, published and quoted by Giovanni Battista Ramusio. In 1509, the Portuguese under Francisco de Almeida won a critical victory in the battle of Diu against a joint Mamluk and Arab fleet sent to counteract their presence in the Arabian Sea. The retreat of the Mamluks and Arabs enabled the Portuguese to implement their strategy of controlling the Indian Ocean. Afonso de Albuquerque set sail in April 1511 from Goa to Malacca with a force of 1,200 men and seventeen or eighteen ships. 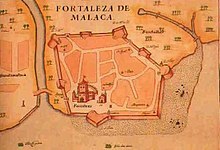 Following his capture of the city on 24 August 1511, it became a strategic base for Portuguese expansion in the East Indies; consequently the Portuguese were obliged to build a fort they named A Famosa to defend it. That same year, the Portuguese, desiring a commercial alliance, sent an ambassador, Duarte Fernandes, to the kingdom of Ayudhya, where he was well received by king Ramathibodi II. In 1526, a large force of Portuguese ships under the command of Pedro Mascarenhas was sent to conquer Bintan, where Sultan Mahmud was based. Earlier expeditions by Diogo Dias and Afonso de Albuquerque had explored that part of the Indian Ocean, and discovered several islands new to Europeans. Mascarenhas served as Captain-Major of the Portuguese colony of Malacca from 1525 to 1526, and as viceroy of Goa, capital of the Portuguese possessions in Asia, from 1554 until his death in 1555. He was succeeded by Francisco Barreto, who served with the title of "governor-general". To enforce a trade monopoly, Muscat, and Hormuz in the Persian Gulf, were seized by Afonso de Albuquerque in 1507, and in 1507 and 1515, respectively. He also entered into diplomatic relations with Persia. In 1513 while trying to conquer Aden, an expedition led by Albuquerque cruised the Red Sea inside the Bab al-Mandab, and sheltered at Kamaran island. In 1521, a force under António Correia conquered Bahrain, ushering in a period of almost eighty years of Portuguese rule of the Persian Gulf. In the Red Sea, Massawa was the most northerly point frequented by the Portuguese until 1541, when a fleet under Estevão da Gama penetrated as far as Suez. In 1511, the Portuguese were the first Europeans to reach the city of Guangzhou by the sea, and they settled on its port for a commercial monopoly of trade with other nations. They were later expelled from their settlements, but they were allowed the use of Macau, which was also occupied in 1511, and to be appointed in 1557 as the base for doing business with Guangzhou. The quasi-monopoly on foreign trade in the region would be maintained by the Portuguese until the early seventeenth century, when the Spanish and Dutch arrived. The Portuguese Diogo Rodrigues explored the Indian Ocean in 1528, he explored the islands of Réunion, Mauritius, and Rodrigues, naming it the Mascarene or Mascarenhas Islands, after his countryman Pedro Mascarenhas, who had been there before. The Portuguese presence disrupted and reorganised the Southeast Asian trade, and in eastern Indonesia they introduced Christianity. After the Portuguese annexed Malacca in August 1511, one Portuguese diary noted 'it is thirty years since they became Moors'- giving a sense of the competition then taking place between Islamic and European influences in the region. Afonso de Albuquerque learned of the route to the Banda Islands and other 'Spice Islands', and sent an exploratory expedition of three vessels under the command of António de Abreu, Simão Afonso Bisigudo and Francisco Serrão. On the return trip, Francisco Serrão was shipwrecked at Hitu island (northern Ambon) in 1512. There he established ties with the local ruler who was impressed with his martial skills. The rulers of the competing island states of Ternate and Tidore also sought Portuguese assistance and the newcomers were welcomed in the area as buyers of supplies and spices during a lull in the regional trade due to the temporary disruption of Javanese and Malay sailings to the area following the 1511 conflict in Malacca. The spice trade soon revived but the Portuguese would not be able to fully monopolize nor disrupt this trade. Allying himself with Ternate's ruler, Serrão constructed a fortress on that tiny island and served as the head of a mercenary band of Portuguese seamen under the service of one of the two local feuding sultans who controlled most of the spice trade. Such an outpost far from Europe generally only attracted the most desperate and avaricious, and as such the feeble attempts at Christianization only strained relations with Ternate's Muslim ruler. Serrão urged Ferdinand Magellan to join him in Maluku, and sent the explorer information about the Spice Islands. Both Serrão and Magellan, however, perished before they could meet one another. In 1535 Sultan Tabariji was deposed and sent to Goa in chains, where he converted to Christianity and changed his name to Dom Manuel. After being declared innocent of the charges against him he was sent back to reassume his throne, but died en route at Malacca in 1545. He had however, already bequeathed the island of Ambon to his Portuguese godfather Jordão de Freitas. Following the murder of Sultan Hairun at the hands of the Europeans, the Ternateans expelled the hated foreigners in 1575 after a five-year siege. The Portuguese first landed in Ambon in 1513, but it only became the new centre for their activities in Maluku following the expulsion from Ternate. European power in the region was weak and Ternate became an expanding, fiercely Islamic and anti-European state under the rule of Sultan Baab Ullah (r. 1570 – 1583) and his son Sultan Said. The Portuguese in Ambon, however, were regularly attacked by native Muslims on the island's northern coast, in particular Hitu which had trading and religious links with major port cities on Java's north coast. Altogether, the Portuguese never had the resources or manpower to control the local trade in spices, and failed in attempts to establish their authority over the crucial Banda Islands, the nearby centre of most nutmeg and mace production. Following Portuguese missionary work, there have been large Christian communities in eastern Indonesia particularly among the Ambonese. By the 1560s there were 10,000 Catholics in the area, mostly on Ambon, and by the 1590s there were 50,000 to 60,000, although most of the region surrounding Ambon remained Muslim. Mauritius was visited by the Portuguese between 1507 (by Diogo Fernandes Pereira) and 1513. The Portuguese took no interest in the isolated Mascarene islands. Their main African base was in Mozambique, and therefore the Portuguese navigators preferred to use the Mozambique Channel to go to India. The Comoros at the north proved to be a more practical port of call. Portuguese North America (in present-day Canada); Vaz Dourado, c.1576. Based on the Treaty of Tordesillas, Manuel I claimed territorial rights in the area visited by John Cabot in 1497 and 1498. To that end, in 1499 and 1500, the Portuguese mariner João Fernandes Lavrador visited the northeast Atlantic coast and Greenland and the north Atlantic coast of Canada, which accounts for the appearance of "Labrador" on topographical maps of the period. Subsequently, in 1501 and 1502 the Corte-Real brothers explored and charted Greenland and the coasts of present-day Newfoundland and Labrador, claiming these lands as part of the Portuguese Empire. Whether or not the Corte-Reals expeditions were also inspired by or continuing the alleged voyages of their father, João Vaz Corte-Real (with other Europeans) in 1473, to Terra Nova do Bacalhau (Newfoundland of the Codfish), remains controversial, as the 16th century accounts of the 1473 expedition differ considerably. In 1520–1521, João Álvares Fagundes was granted donatary rights to the inner islands of the Gulf of St. Lawrence. Accompanied by colonists from mainland Portugal and the Azores, he explored Newfoundland and Nova Scotia (possibly reaching the Bay of Fundy on the Minas Basin), and established a fishing colony on Cape Breton Island, that would last some years or until at least 1570s, based on contemporary accounts. Brazil was claimed by Portugal in April 1500, on the arrival of the Portuguese fleet commanded by Pedro Álvares Cabral. The Portuguese encountered natives divided into several tribes. The first settlement was founded in 1532. Some European countries, especially France, were also sending excursions to Brazil to extract brazilwood. Worried about the foreign incursions and hoping to find mineral riches, the Portuguese crown decided to send large missions to take possession of the land and combat the French. In 1530, an expedition led by Martim Afonso de Sousa arrived to patrol the entire coast, ban the French, and to create the first colonial villages, like São Vicente, at the coast. As time passed, the Portuguese created the Viceroyalty of Brazil. 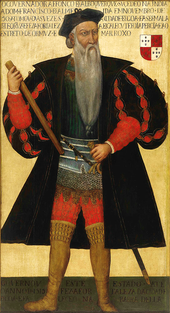 Colonization was effectively begun in 1534, when Dom João III divided the territory into twelve hereditary captaincies, a model that had previously been used successfully in the colonization of the Madeira Island, but this arrangement proved problematic and in 1549 the king assigned a Governor-General to administer the entire colony, Tomé de Sousa. The Portuguese frequently relied on the help of Jesuits and European adventurers who lived together with the aborigines and knew their languages and culture, such as João Ramalho, who lived among the Guaianaz tribe near today's São Paulo, and Diogo Álvares Correia, who lived among the Tupinamba natives near today's Salvador de Bahia. The Portuguese assimilated some of the native tribes while others were enslaved or exterminated in long wars or by European diseases to which they had no immunity. By the mid-16th century, sugar had become Brazil's most important export and the Portuguese imported African slaves to produce it. The Portuguese victory at the Second Battle of Guararapes, ended Dutch presence in Brazil. Mem de Sá was the third Governor-General of Brazil in 1556, succeeding Duarte da Costa, in Salvador of Bahia when France founded several colonies. Mem de Sá was supporting of Jesuit priests, Fathers Manuel da Nóbrega and José de Anchieta, who founded São Vicente in 1532, and São Paulo, in 1554. French colonists tried to settle in present-day Rio de Janeiro, from 1555 to 1567, the so-called France Antarctique episode, and in present-day São Luís, from 1612 to 1614 the so-called France Équinoxiale. Through wars against the French the Portuguese slowly expanded their territory to the southeast, taking Rio de Janeiro in 1567, and to the northwest, taking São Luís in 1615. The Dutch sacked Bahia in 1604, and temporarily captured the capital Salvador. In the 1620s and 1630s, the Dutch West India Company established many trade posts or colonies. The Spanish silver fleet, which carried silver from Spanish colonies to Spain, were seized by Piet Heyn in 1628. In 1629 Suriname and Guyana were established. [clarification needed] In 1630 the West India Company conquered part of Brazil, and the colony of New Holland (capital Mauritsstad, present-day Recife) was founded. John Maurice of Nassau prince of Nassau-Siegen, was appointed as the governor of the Dutch possessions in Brazil in 1636 by the Dutch West India Company on recommendation of Frederick Henry. He landed at Recife, the port of Pernambuco and the chief stronghold of the Dutch, in January 1637. By a series of successful expeditions, he gradually extended the Dutch possessions from Sergipe on the south to São Luís de Maranhão in the north. In 1624 most of the inhabitants of the town Pernambuco (Recife), in the future Dutch colony of Brazil were Sephardic Jews who had been banned by the Portuguese Inquisition to this town at the other side of the Atlantic Ocean. As some years afterward the Dutch in Brazil appealed to Holland for craftsmen of all kinds, many Jews went to Brazil; about 600 Jews left Amsterdam in 1642, accompanied by two distinguished scholars – Isaac Aboab da Fonseca and Moses Raphael de Aguilar. In the struggle between Holland and Portugal for the possession of Brazil the Dutch were supported by the Jews. From 1630 to 1654, the Dutch set up more permanently in the Nordeste and controlled a long stretch of the coast most accessible to Europe, without, however, penetrating the interior. But the colonists of the Dutch West India Company in Brazil were in a constant state of siege, in spite of the presence in Recife of John Maurice of Nassau as governor. After several years of open warfare, the Dutch formally withdrew in 1661. Portuguese sent military expeditions to the Amazon Rainforest and conquered British and Dutch strongholds, founding villages and forts from 1669. In 1680 they reached the far south and founded Sacramento on the bank of the Rio de la Plata, in the Eastern Strip region (present-day Uruguay). In the 1690s, gold was discovered by explorers in the region that would later be called Minas Gerais (General Mines) in current Mato Grosso and Goiás. Before the Iberian Union period (1580–1640), Spain tried to prevent Portuguese expansion into Brazil with the 1494 Treaty of Tordesillas. After the Iberian Union period, the Eastern Strip were settled by Portugal. This was disputed in vain, and in 1777 Spain confirmed Portuguese sovereignty. Battle of Cartagena de Indias March–May 1741, during this battle the Spanish Empire defeated a British fleet of over 30,000 professional soldiers, 51 warships and 135 transport ships counting the Spanish army only less than 2400 professional soldiers, 600 natives and 6 ships. In 1578 the Saadi sultan Ahmad al-Mansur, contemporary of Queen Elizabeth I, defeated Portugal at the Battle of Ksar El Kebir, beating the young king Sebastian I, a devout Christian who believed in the crusade to defeat Islam. Portugal had landed in North Africa after Abu Abdallah asked him to help recover the Saadian throne. Abu Abdallah's uncle, Abd Al-Malik, had taken it from Abu Abdallah with Ottoman Empire support. The defeat of Abu Abdallah and the death of Portugal's king led to the end of the Portuguese Aviz dynasty and later to the integration of Portugal and its empire at the Iberian Union for 60 years under Sebastian's uncle Philip II of Spain. Philip was married to his relative Mary I cousin of his father, due to this, Philip was King of England and Ireland in a dynastic union with Spain. As a result of the Iberian Union, Phillip II's enemies became Portugal's enemies, such as the Dutch in the Dutch–Portuguese War, England or France. War with the Dutch led to invasions of many countries in Asia, including Ceylon and commercial interests in Japan, Africa (Mina), and South America. Even though the Portuguese were unable to capture the entire island of Ceylon, they were able to control its coastal regions for a considerable time. From 1580 to 1670 mostly, the Bandeirantes in Brazil focused on slave hunting, then from 1670 to 1750 they focused on mineral wealth. Through these expeditions and the Dutch–Portuguese War, Colonial Brazil expanded from the small limits of the Tordesilhas Line to roughly the same borders as current Brazil. In the 17th century, taking advantage of this period of Portuguese weakness, the Dutch occupied many Portuguese territories in Brazil. John Maurice, Prince of Nassau-Siegen was appointed as the governor of the Dutch possessions in Brazil in 1637 by the Dutch West India Company. He landed at Recife, the port of Pernambuco, in January 1637. In a series of expeditions, he gradually expanded from Sergipe on the south to São Luís de Maranhão in the north. He likewise conquered the Portuguese possessions of Elmina Castle, Saint Thomas, and Luanda and Angola. The Dutch intrusion into Brazil was long lasting and troublesome to Portugal. The Seventeen Provinces captured a large portion of the Brazilian coast including the provinces of Bahia, Pernambuco, Paraíba, Rio Grande do Norte, Ceará, and Sergipe, while Dutch privateers sacked Portuguese ships in both the Atlantic and Indian Oceans. The large area of Bahia and its city, the strategically important Salvador, was recovered quickly by an Iberian military expedition in 1625. After the dissolution of the Iberian Union in 1640, Portugal re-established authority over its lost territories including remaining Dutch controlled areas. The other smaller, less developed areas were recovered in stages and relieved of Dutch piracy in the next two decades by local resistance and Portuguese expeditions. Spanish Formosa was established in Taiwan, first by Portugal in 1544 and later renamed and repositioned by Spain in Keelung. It became a natural defence site for the Iberian Union. The colony was designed to protect Spanish and Portuguese trade from interference by the Dutch base in the south of Taiwan. The Spanish colony was short-lived due to the unwillingness of Spanish colonial authorities in Manila to defend it. While technological superiority and cultural factors played an important role in the victories of the conquistadors in the Americas, their conquest was greatly facilitated by old world diseases: smallpox, chicken pox, diphtheria, typhus, influenza, measles, malaria and yellow fever. The diseases were carried to distant tribes and villages. This typical path of disease transmission moved much faster than the conquistadors, so that as they advanced, resistance weakened. Epidemic disease is commonly cited as the primary reason for the population collapse. The American natives lacked immunity to these infections. Recently developed tree-ring evidence shows that the illness which reduced the population in Aztec Mexico was aided by a great drought in the 16th century, and which continued through the arrival of the Spanish conquest. This has added to the body of epidemiological evidence indicating that cocoliztli epidemics (Nahuatl name for viral haemorrhagic fever) were indigenous fevers transmitted by rodents and aggravated by the drought. The cocoliztli epidemic from 1545 to 1548 killed an estimated 5 to 15 million people, or up to 80% of the native population. The cocoliztli epidemic from 1576 to 1578 killed an estimated, additional 2 to 2.5 million people, or about 50% of the remainder. The American researcher H.F. Dobyns said that 95% of the total population of the Americas died in the first 130 years, and that 90% of the population of the Inca Empire died in epidemics. Cook and Borah of the University of California at Berkeley believe that the indigenous population in Mexico declined from 25.2 million in 1518 to 700,000 people in 1623, less than 3% of the original population. The conquistadors found new animal species, but reports confused these with monsters such as giants, dragons, or ghosts. Stories about castaways on mysterious islands were common. An early motive for exploration was the search for Cipango, the place where gold was born. Cathay and Cibao were later goals. The Seven Cities of Gold, or "Cibola", was rumoured to have been built by Native Americans somewhere in the desert Southwest. [clarification needed] As early as 1611, Sebastián Vizcaíno surveyed the east coast of Japan and searched for two mythical islands called Rico de Oro (Rich in Gold) and Rico de Plata (Rich in Silver). Books such as The Travels of Marco Polo fuelled rumours of mythical places. Stories included the half-fabulous Christian Empire of "Prester John", the kingdom of the White Queen on the "Western Nile" (Sénégal River), the Fountain of Youth, cities of Gold in North and South America such as Quivira, Zuni-Cibola Complex, and El Dorado, and wonderful kingdoms of the Ten Lost Tribes and women named Amazons. In 1542, Francisco de Orellana reached the Amazon River, naming it after a tribe of warlike women he claimed to have fought there. Others claimed that the similarity between "Indio" and "Iudio", the word for Jew in Spanish language about 1500, revealed the indigenous peoples' origin. Portuguese traveller Antonio de Montezinos reported that some of the Lost Tribes were living among the Native Americans of the Andes in South America. Gonzalo Fernández de Oviedo y Valdés wrote that Ponce de León was looking for the waters of Bimini to cure his aging. A similar account appears in Francisco López de Gómara's Historia General de las Indias of 1551. Then in 1575, Hernando de Escalante Fontaneda, a shipwreck survivor who had lived with the Native Americans of Florida for 17 years, published his memoir in which he locates the Fountain of Youth in Florida, and says that Ponce de León was supposed to have looked for them there. This land[clarification needed] somehow also became confused with the Boinca or Boyuca mentioned by Juan de Solis, although Solis's navigational data placed it in the Gulf of Honduras. Sir Walter Raleigh and some Italian, Spanish, Dutch, French and Portuguese expeditions were looking for the wonderful Guiana empire that gave its name to the present day countries of the Guianas. Several expeditions went in search of these fabulous places, but returned empty-handed, or brought less gold than they had hoped. They found other precious metals such as silver, which was particularly abundant in Potosí, in modern-day Bolivia. They discovered new routes, ocean currents, trade winds, crops, spices and other products. In the sail era knowledge of winds and currents was essential, for example, the Agulhas current long prevented Portuguese sailors from reaching India. Various places in Africa and the Americas have been named after the imagined cities made of gold, rivers of gold and precious stones. Shipwrecked off Santa Catarina island in present-day Brazil, Aleixo Garcia living among the Guaranís heard tales of a "White King" who lived to the west, ruling cities of incomparable riches and splendour. Marching westward in 1524 to find the land of the "White King", he was the first European to cross South America from the East. He discovered a great waterfall[clarification needed] and the Chaco Plain. He managed to penetrate the outer defences of the Inca Empire on the hills of the Andes, in present-day Bolivia, the first European to do so, eight years before Francisco Pizarro. Garcia looted a booty of silver. When the army of Huayna Cápac arrived to challenge him, Garcia then retreated with the spoils, only to be assassinated by his Indian allies near San Pedro on the Paraguay River. Map of the Island of California, circa 1650; restored. Columbus' discovery of what they thought at that time was India, and the constant competition of Portugal and Spain led to a desire for secrecy about every trade route and every colony. As a consequence, many documents that could reach other European countries included fake dates and faked facts, to mislead any other nation's possible efforts. For example, the Island of California refers to a famous cartographic error propagated on many maps during the 17th and 18th centuries, despite contradictory evidence from various explorers. The legend was initially infused with the idea that California was a terrestrial paradise, peopled by black women Amazons. The tendency to secrecy and falsification of dates casts doubts about the authenticity of many primary sources. Several historians have hypothesized that John II may have known of the existence of Brazil and North America as early as 1480, thus explaining his wish in 1494 at the signing of the Treaty of Tordesillas, to push the line of influence further west. Many historians suspect that the real documents[clarification needed] would have been placed in the Library of Lisbon. Unfortunately, a fire following the 1755 Lisbon earthquake destroyed nearly all of the library's records, but an extra copy[clarification needed] available in Goa was transferred to Lisbon's Tower of Tombo, during the following 100 years. The Corpo Cronológico (Chronological Corpus), a collection of manuscripts on the Portuguese explorations and discoveries in Africa, Asia and Latin America, was inscribed on UNESCO's Memory of the World Register in 2007 in recognition of its historical value "for acquiring knowledge of the political, diplomatic, military, economic and religious history of numerous countries at the time of the Portuguese Discoveries." Ferdinand incorporated the American territories into his domain and then withdrew the authority granted to governor Christopher Columbus and the first conquistadors. He established direct royal control with the Council of the Indies, the most important administrative organ of the Spanish Empire, both in the Americas and in Asia. After unifying Castile, Ferdinand introduced to Castile many laws, regulations and institutions such as the Inquisition, that were typical in Aragon. These laws were later used in the new lands. The Laws of Burgos, created in 1512–1513, were the first codified set of laws governing the behavior of settlers in Spanish colonial America, particularly with regards to Native Americans. They forbade the maltreatment of indigenous people, and endorsed their conversion to Catholicism. The evolving structure of colonial government was not fully formed until the third quarter of the 16th century; however, los Reyes Católicos designated Juan Rodríguez de Fonseca to study the problems related to the colonization process. Rodríguez de Fonseca effectively became minister for the Indies and laid the foundations for the creation of a colonial bureaucracy, combining legislative, executive and judicial functions. Rodríguez de Fonseca presided over the council, which contained a number of members of the Council of Castile (Consejo de Castilla), and formed a Junta de Indias of about eight counsellors. Emperor Charles V was already using the term "Council of the Indies" in 1519. Philip II of Spain (1527–1598). The Crown reserved for itself important tools of intervention. The "capitulacion" clearly stated that the conquered territories belonged to the Crown, not to the individual. On the other hand, concessions allowed the Crown to guide the Companies conquests to certain territories, depending on their interests. In addition, the leader of the expedition received clear instructions about their duties towards the army, the native population, the type of military action. A written report about the results was mandatory. The army had a royal official, the "veedor". The "veedor" or notary, ensured they complied with orders and instructions and preserved the King's share of the booty. In practice the Capitán had almost unlimited power. Besides the Crown and the conquistador, they were very important the backers who were charged with anticipating the money to the Capitán and guarantee payment of obligations. Armed groups sought supplies and funds in various ways. Financing was requested from the King, delegates of the Crown, the nobility, rich merchants or the troops themselves. The more professional campaigns were funded by the Crown. Campaigns were sometimes initiated by inexperienced governors, because in Spanish Colonial America, offices were bought or handed to relatives or cronies. Sometimes, an expedition of conquistadors were a group of influential men who had recruited and equipped their fighters, by promising a share of the booty. The conquistador borrowed as little as possible, preferring to invest all their belongings. Sometimes, every soldier brought his own equipment and supplies, other times the soldiers received gear as an advance from the conquistador. The Pinzón brothers, seamen of the Tinto–Odiel participated in Columbus's undertaking. They also supported the project economically, supplying money from their personal fortunes. Sponsors included governments, the king, viceroys, and local governors backed by rich men. The contribution of each individual conditioned the subsequent division of the booty, receiving a portion the pawn (lancero, piquero, alabardero, rodelero) and twice a man on horseback (caballero) owner of a horse. [clarification needed] Sometimes part of the booty consisted of women and/or slaves. Even the dogs, important weapons of war in their own right, were in some cases rewarded. The division of the booty produced conflicts, such as the one between Pizarro and Almagro. Shrunken head of a mestizo man by Jívaro indigenous people. 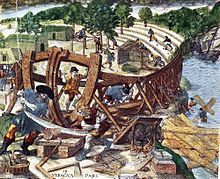 In 1599, the Jivaro destroyed Spanish settlements in eastern Ecuador and killed all the men. Conquistadors had overwhelming military advantages over the native peoples. They belonged to a more militarily advanced civilization with better techniques, tools, firearms, artillery, iron, steel and domesticated animals. Horses and mules carried them, pigs fed them and dogs fought for them. The indigenous peoples had the advantage of established settlements, determination to remain independent and large numerical superiority. European diseases and divide and conquer tactics contributed to the defeat of the native populations. In the Iberian peninsula, in a situation of constant conflict, warfare and daily life were strongly interlinked. Small, lightly equipped armies were maintained at all times. The state of war continued intermittently for centuries and created a very warlike culture in Iberia. The Europeans practiced war within the terms and laws of their concept of a just war. While Spanish soldiers went to the battlefield to kill their enemies, the Aztecs and Mayas captured their enemies for use as sacrificial victims to their gods—a process called "flower war" by Spanish historians. In traditional cultures of the Stone Age, Bronze Age, and hunter-gatherer societies the warfare was mostly 'endemic', long duration, low intensity, usually evolving into almost a ritualized form. By contrast, Europe had moved to 'sporadic' warfare in the Middle Ages due to the availability of professionally mercenary armies. When Italy was ransacked by French and Spanish Armies in the early 1500s, most Italian states were easily defeated by armies practicing sporadic-warfare. Aztec and other native peoples practiced an endemic system of warfare as well, and so were easily defeated by Spanish and Portuguese sporadic-warfare armies in the early 1500s. These forces were capable of quickly moving long distances, allowing a quick return home after battle. Wars were mainly between clans, expelling intruders. On land, these wars combined some European methods with techniques from Muslim bandits in Al-Andalus. These tactics consisted of small groups who attempted to catch their opponents by surprise, through an ambush. In Mombasa, Dom Vasco da Gama resorted to piracy, looting Arab merchant ships, which were generally unarmed trading vessels without heavy cannons. The introduction of gunpowder in Europe in the late 14th century led to the increased preference for infantry-oriented professional armies and gave birth to heavy infantry armoured like a knight, with plate armour and an iron helmet and gunpowder artillery. Other heavy infantry would probably be armed with little armour and maybe a gunpowder weapon that was capable of penetrating armour. When traders from Portugal introduced arquebuses and muskets, Iberian warlords were quick to adapt them, giving them a large advantage. Iberian kingdoms developed expertise in both cannon manufacturing and shipbuilding. Aragon's Crown and Portugal constructed warships equipped with firearms and advanced gunpowder cannons. Spanish and Portuguese conquerors made use of these weapons, including Vasco da Gama and his sons Cristóvão da Gama and the younger brother Estêvão da Gama. Arquebuses played an important role in the victories of Cristóvão da Gama's small and outnumbered army in his 1541–42 campaign in Ethiopia. 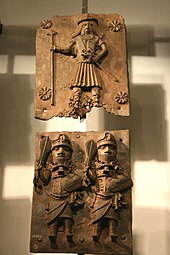 Arquebuses were carried by some soldiers of Hernán Cortés in his conquest of Mexico in the 1520s. In their first contacts with native peoples, the firearms, including arquebuses, used by the conquistadors were formidable weapons. A few effective artillery hits would stop the charging warriors and destroy morale because of the noise and carnage. The small weapons carried by native warriors had little advantage. Alano Español, or Spanish bulldog, carried by the Spanish conquistadors on their expeditions. The most famous of these dogs of war, called Becerrillo, belonged to Ponce de Leon and was the first European dog known to reach North America. Although many American civilizations had developed methods for working soft metals, including gold, silver, bronze, tin and copper, this knowledge was applied mainly to the development of religious and artistic objects, as well as household utensils. Few metals were used for military applications. One exception was that the Quechuas and Purépecha developed weapons of copper and bronze, but these could not match the hardness or durability of iron and steel. Most indigenous cultures were limited to weapons of wood, flint and obsidian. Basque Countrymen near the France–Spain border in 1898, with characteristic horse, donkey and dogs. These were the type of animals introduced to America. Animals were another important factor for Spanish triumph. On the one hand, the introduction of the horse and other domesticated pack animals allowed them greater mobility unknown to the Indian cultures. However, in the mountains and jungles, the Spaniards were less able to use narrow Amerindian roads and bridges made for pedestrian traffic, which were sometimes no wider than a few feet. In places such as Argentina, New Mexico and California, the indigenous people learned horsemanship, cattle raising, and sheep herding. The use of the new techniques by indigenous groups later became a disputed factor in native resistance to the colonial and American governments. The Spaniards were also skilled at breeding dogs for war, hunting and protection. The Molossers, Spanish war dogs and sheep dogs they used in battle were effective as a psychological weapon against the natives, who, in many cases, had never seen domesticated dogs. Although some indigenous peoples of the Western Hemisphere did have domestic dogs, including the current Southwestern US, Aztec and other Central American peoples, the inhabitants of the Arctic/Tundra regions (Inuit, Aleut, Cree), and possibly some South American groups similar to South American fox (Pseudalopex culpaeus) or Yagan dog, during the conquest of the Americas, Spanish conquistadors used Spanish Mastiffs and other Molossers in battle against the Taínos, Aztecs and Mayans. These specially trained dogs were feared because of their strength and ferocity. The strongest big breeds of broad-mouthed dogs were specifically trained for battle. These war dogs were used against barely clothed troops. They were armoured dogs trained to kill and disembowel. The most famous of these dogs of war was a mascot of Ponce de Leon called Becerrillo, the first European dog known to reach North America; another famous dog called Leoncico, the son of Becerillo, and the first European dog known to see the Pacific Ocean, was a mascot of Vasco Núñez de Balboa and accompanied him on several expeditions. The successive expeditions and experience of the Portuguese pilots led to a rapid evolution of Portuguese nautical science. In the thirteenth century they were guided by the sun position. For celestial navigation like other Europeans, they used Greek tools, like the astrolabe and quadrant, which they made easier and simpler. They also created the cross-staff, or cane of Jacob, for measuring at sea the height of the sun and other stars. The Southern Cross became a reference upon the arrival of João de Santarém and Pedro Escobar in the Southern hemisphere in 1471, starting its use in celestial navigation. The results varied throughout the year, which required corrections. To address this the Portuguese used the astronomical tables (Ephemeris), a precious tool for oceanic navigation, which spread widely in the fifteenth century. These tables revolutionized navigation, enabling latitude calculations. The tables of the Almanach Perpetuum, by astronomer Abraham Zacuto, published in Leiria in 1496, were used along with its improved astrolabe, by Vasco da Gama and Pedro Alvares Cabral. The ship that truly launched the first phase of the discoveries along the African coast was the Portuguese caravel. Iberians quickly adopted it for their merchant navy. It was a development based on African fishing boats. They were agile and easier to navigate, with a tonnage of 50 to 160 tons and one to three masts, with lateen triangular sails allowing luffing. The caravel particularly benefited from a greater capacity to tack. The limited capacity for cargo and crew were their main drawbacks, but have not hindered its success. Limited crew and cargo space was acceptable, initially, because as exploratory ships, their "cargo" was what was in the explorer's discoveries about a new territory, which only took up the space of one person. Among the famous caravels are Berrio and Caravela Annunciation. Columbus also used them in his travels. Long oceanic voyages led to larger ships. "Nau" was the Portuguese archaic synonym for any large ship, primarily merchant ships. Due to the piracy that plagued the coasts, they began to be used in the navy and were provided with cannon windows, which led to the classification of "naus" according to the power of its artillery. The carrack or nau was a three- or four-masted ship. It had a high rounded stern with large aftcastle, forecastle and bowsprit at the stem. It was first used by the Portuguese, and later by the Spanish. They were also adapted to the increasing maritime trade. They grew from 200 tons capacity in the 15th century to 500. In the 16th century they usually had two decks, stern castles fore and aft, two to four masts with overlapping sails. In India travels in the sixteenth century used carracks, large merchant ships with a high edge and three masts with square sails, that reached 2,000 tons. 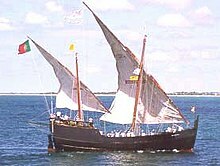 Besides coastal exploration, Portuguese ships also made trips further out to gather meteorological and oceanographic information. 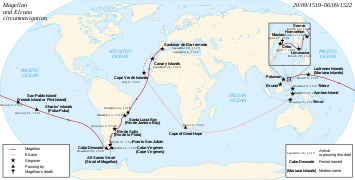 These voyages revealed the archipelagos of Bissagos Islands where the Portuguese were defeated by native people in 1535, Madeira, the Azores, Cape Verde, Sao Tome, Trindade and Martim Vaz, Saint Peter and Saint Paul Archipelago, Fernando de Noronha, Corisco, Elobey Grande, Elobey Chico Annobon Island, Ascension Island, Bioko Island, Falkland Islands, Principe Island, Saint Helena Island, Tristan da Cunha Island and Sargasso Sea. The knowledge of wind patterns and currents, the trade winds and the oceanic gyres in the Atlantic, and the determination of latitude led to the discovery of the best ocean route back from Africa: crossing the Central Atlantic to the Azores, using the winds and currents that spin clockwise in the Northern Hemisphere because of atmospheric circulation and the effect of Coriolis, facilitating the way to Lisbon and thus enabling the Portuguese to venture farther from shore, a manoeuvre that became known as the "volta do mar" (return of the sea). In 1565, the application of this principle in the Pacific Ocean led the Spanish discovering the Manila Galleon trade route. In 1339 Angelino Dulcert of Majorca produced the portolan chart map. Evidently drawing from the information provided in 1336 by Lanceloto Malocello sponsored by King Dinis of Portugal. It showed Lanzarote island, named Insula de Lanzarotus Marocelus and marked by a Genoese shield, as well as the island of Forte Vetura (Fuerteventura) and Vegi Mari (Lobos), although Dulcert also included some imaginary islands himself, notably Saint Brendan's Island, and three islands he names Primaria, Capraria and Canaria. Mestre Jacome was a Majorcan cartographer induced by Portuguese prince Henry the Navigator to move to Portugal in the 1420s to train Portuguese map-makers in Majorcan-style cartography. 'Jacome of Majorca' is even sometimes described as the head of Henry's observatory and "school" at Sagres. It is thought that Jehuda Cresques, son of Jewish cartographer Abraham Cresques of Palma in Majorca, and Italian-Majorcan Angelino Dulcert were cartographers at the service of Prince Henry. Majorca had many skilled Jewish cartographers. 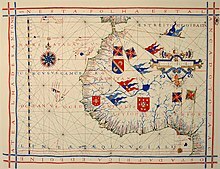 However, the oldest signed Portuguese sea chart is a Portolan made by Pedro Reinel in 1485 representing the Western Europe and parts of Africa, reflecting the explorations made by Diogo Cão. Reinel was also author of the first nautical chart known with an indication of latitudes in 1504 and the first representation of a wind rose. With his son, cartographer Jorge Reinel and Lopo Homem, they participated in the making of the atlas known as "Lopo Homem-Reinés Atlas" or "Miller Atlas", in 1519. They were considered the best cartographers of their time. Emperor Charles V wanted them to work for him. In 1517 King Manuel I of Portugal handed Lopo Homem a charter giving him the privilege to certify and amend all compass needles in vessels. The third phase of nautical cartography was characterized by the abandonment of Ptolemy's representation of the East and more accuracy in the representation of lands and continents. Fernão Vaz Dourado (Goa ≈1520 – ≈1580), produced work of extraordinary quality and beauty, giving him a reputation as one of the best cartographers of the time. Many of his charts are large scale. The Magellan–Elcano voyage. The first travel around the world. Nicolás Federmann (Venezuela and Colombia, 1537–1539). Bandeirantes were crucial in Portuguese exploration, colonization, and pacification of the Brazilian interior. 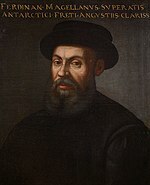 Fernão Magalhães also known as Ferdinand Magellan and Magallanes, served Spain too. ^ Vanhanen, Tatu (1997). Prospects of democracy: a study of 172 countries. New York: Routledge. p. 112. ISBN 0-415-14405-1. ^ Martinez VP, Bellomo C, San Juan J, Pinna D, Forlenza R, Elder M, Padula PJ (2005). "Person-to-person transmission of Andes virus". Emerging Infect. Dis. 11 (12): 1848–53. doi:10.3201/eid1112.050501. PMC 3367635. PMID 16485469. ^ "CDC Yellow Fever". Archived from the original on 23 November 2010. Retrieved 2010-03-13. ^ Conquest in the Americas. Archived from the original on 31 October 2009. ^ "Spanish Town". Jamaica National Heritage Trust. Archived from the original on 25 September 2010. Retrieved 30 September 2010. ^ Andrea, Alfred J.; Overfield, James H. (2005). "Letter by Christopher Columbus concerning recently discovered islands". The Human Record. 1. Houghton Mifflin Company. p. 8. ISBN 0-618-37040-4. ^ The numbers for Grijalva's expedition are as given by Bernal Díaz, who participated in the voyage. See Díaz del Castillo (1963, p.27). ^ Juan de Samano (9 October 2009). "Relacion de los primeros descubrimientos de Francisco Pizarro y Diego de Almagro, 1526". bloknot.info (A.Skromnitsky). Retrieved 2009-10-10. ^ Bolivia & Main Cities / Potosí Archived 6 December 2008 at the Wayback Machine from boliviaweb.com. Retrieved 2010-09-27. ^ Matthew Restall (2009). The Black Middle: Africans, Mayas, and Spaniards in Colonial Yucatan. Stanford University Press. pp. xv, 7, 114. ISBN 978-0-8047-4983-1. ^ Latin America in Colonial Times. Cambridge University Press. 2011. ^ "John Wesley Powell's Exploration of the Colorado River". U.S. Geological Survey. 28 March 2006. Archived from the original on 5 April 2015. Retrieved 2012-02-19. ^ Barkham (1984), p. 515. ^ Rafnsson (2006), p. 4. ^ "La odisea en Terranova de los balleneros vascos – GARA". www.GARA.net. Retrieved 30 May 2017. ^ Between 1550 and the early 17th century, Red Bay, known as Balea Baya (Whale Bay), was a centre for whaling operations. ^ Cogswell, Jr., Philip (1977). Capitol Names: Individuals Woven Into Oregon's History. Portland, Oregon: Oregon Historical Society. pp. 9–10. ^ Fish, S. (2011). The Manila-Acapulco Galleons: The Treasure Ships of the Pacific With an Annotated List of the Transpacific Galleons 1565–1815. translated by. AuthorHouse. ISBN 9781456775421. ^ Collins, Robert O.; Burns, James M. (2007). "Part II, Chapter 12: The arrival of Europeans in sub-Saharan Africa". A History of Sub-Saharan Africa. Cambridge University Press. p. 179. ISBN 0-521-86746-0. in 1475 when his contract expired Rui de Sequeira had reached Cabo Santa Caterina (Cape Saint Catherine) south of the equator and the Gabon River. ^ Arthur Percival, Newton (1970) . "Vasco da Gama and The Indies". The Great Age of Discovery. Ayer Publishing. p. 48. ISBN 0-8337-2523-8. and about the same time Lopo Gonçalves crossed the Equator, while Ruy de Sequeira went on to Cape St. Catherine, two degrees south of the line. ^ Koch, Peter O. (2003). "Following the Dream of Prince Henry". To the Ends of the Earth: The Age of the European Explorers. McFarland & Company. p. 62. ISBN 0-7864-1565-7. Gomes was obligated to pledge a small percentage of his profits to the royal treasury. Starting from Sierra Leone in 1469, this monetarily motivated entrepreneurial explorer spent the next five years extending Portugal's claims even further than he had been required, reaching as far south as Cape St. Catherine before his contract came up for renewal. ^ Gates, Louis; Anthony Appiah (1999). Africana: The Encyclopedia of the African and African American Experience. p. 1105. ^ Taonga, New Zealand Ministry for Culture and Heritage Te Manatu. "Proof of Spanish discovery?". www.Teara.govt.nz. Retrieved 30 May 2017. ^ "Portuguese visited New Zealand '250 years before Cook'". NZ Herald. Retrieved 2018-04-18. ^ Stirling, Rose (10 August 2011). "Ancient facts unfold". Retrieved 30 May 2017 – via Stuff.co.nz. ^ "The Expulsion 1492 Chronicles". AISH.com. Retrieved 30 May 2017. ^ Ingrams, W. H. (1 June 1967). Zanzibar: Its History and Its People. Psychology Press. ISBN 978-0-7146-1102-0. ^ The East Africa Protectorate, Sir Charles Eliot, K.C.M.G., published by Edward Arnold, London, 1905, digitized by the Internet Archive in 2008 (PDF format). ^ Pearce, Francis Barrow (30 May 2017). "Zanzibar: The Island Metropolis of Eastern Africa". Dutton. Retrieved 30 May 2017 – via Google Books. ^ "Sri Lanka History". Thondaman Foundation. Retrieved 22 August 2011. ^ K. M. De Silva (January 1981). A History of Sri Lanka. University of California Press. pp. 101–102. ISBN 978-0-520-04320-6. ^ Chandra Richard De Silva (2009). Portuguese Encounters with Sri Lanka and the Maldives: Translated Texts from the Age of Discoveries. Ashgate Publishing, Ltd. p. 153. ISBN 978-0-7546-0186-9. ^ Jude Lal Fernando (11 June 2013). Religion, Conflict and Peace in Sri Lanka: The Politics of Interpretation of Nationhoods. LIT Verlag Münster. p. 135. ISBN 978-3-643-90428-7. ^ C. Gaston Perera (2007). Kandy fights the Portuguese: a military history of Kandyan resistance. Vijitha Yapa Publications. p. 148. ISBN 978-955-1266-77-6. ^ Donald Obeyesekere (1999). Outlines of Ceylon History. Asian Educational Services. p. 232. ISBN 978-81-206-1363-8. ^ Merle Calvin Ricklefs (1993). A History of Modern Indonesia Since C. 1300. Stanford University Press. p. 23. ISBN 978-0-8047-2194-3. ^ Patit Paban Mishra (2010). The History of Thailand. ABC-CLIO. p. 50. ISBN 978-0-313-34091-8. ^ Robert Kerr (1824). "Conquest of India". A General History and Collection of Voyages and Travels (Complete). VI. W. Blackwood and T. Cadell. pp. 441–442. ^ Ricklefs, M.C. (1991). A History of Modern Indonesia Since c.1300, 2nd Edition. London: MacMillan. p. 26. ISBN 0-333-57689-6. ^ E. C. Abendanon; E. Heawood (December 1919). "Missing Links in the Development of the Ancient Portuguese Cartography of the Netherlands East Indian Archipelago". The Geographical Journal. Blackwell Publishing. 54 (6): 347–355. doi:10.2307/1779411. JSTOR 1779411. ^ a b c Ricklefs, M.C. (1991). A History of Modern Indonesia Since c.1300, 2nd Edition. London: MacMillan. p. 24. ISBN 0-333-57689-6. ^ a b c Ricklefs, M.C. (1991). A History of Modern Indonesia Since c.1300, 2nd Edition. London: MacMillan. p. 25. ISBN 0-333-57689-6. ^ "John Cabot's voyage of 1498". Memorial University of Newfoundland (Newfoundland and Labrador Heritage). 2000. Retrieved 2010-04-12. ^ Bailey Bailey Wallys Diffie (1977). Foundations of the Portuguese Empire: 1415–1580. U of Minnesota Press. p. 464. ISBN 978-0-8166-0782-2. ^ Skidmore, pp. 30, 32. ^ Whether several diseases from "the New World" (America) struck Europe shortly after Columbus's voyage is also debated among scholars. Goodling, Stacy. "Effects of European Diseases on the Inhabitants of the New World". Archived from the original on 10 May 2008. ^ "The Journey of Alvar Nuńez Cabeza de Vaca Archived 5 October 2012 at the Wayback Machine"
^ a b Mann, Charles (2006). 1491: New Revelations of the Americas Before Columbus. Madrid: Taurus. ^ Dobyns, H. F. American population dynamics in Eastern North Americas. Knoxville (Tenn.): University of Tennessee Press. ^ Dobyns, H. F. (1983). Their number become thined: Native American population dynamics in Eastern North America. Knoxville (Tenn.): University of Tennessee Press. ^ Cook, S. F.; Borah, W. W. (1963). The Indian population of Central Mexico. Berkeley (Cal. ): University of California Press. ^ "El imaginario del conquistador español (página 3)" (in Spanish). ^ "Fontaneda's Memoir, translation by Buckingham Smith, 1854. From keyshistory.org. 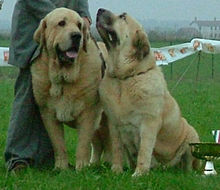 Retrieved 28 March 2007". ^ de las Casas, Bartolomé. "Tomo I. Capítulo XXXIV, pág. 256". Historia de las Indias. Retrieved 2008-10-18. On the website of the Biblioteca Virtual Miguel de Cervantes. ^ Derr, Mark (2004). A Dog's History of America. North Point Press. pp. 23–45. ISBN 978-0-86547-631-8. Lay summary. ^ Paul. "Monday Mammal #10: Yagán "dog"". TheObligateScientist.Blogspot.com. Retrieved 30 May 2017. ^ Stannard, David. American holocaust: the conquest of the New World. ^ "Mestre Jacome" the Majorcan cartographer is first mentioned by Duarte Pacheco Pereira in his Esmeraldo de situ Orbis (c. 1507, p. 58). João de Barros, in his Decadas de Asia (1552: I.16 p. 133) adds that he was also a master instrument-maker. Chasteen, John Charles (2001). Born in Blood And Fire: A Concise History of Latin America. New York: W. W. Norton & Co. ISBN 978-0-393-97613-7. Hinz, Felix (2014): Spanish-Indian encounters: the conquest and creation of new empires, in: Robert Aldrich, Kirsten McKenzie (eds. ): The Routledge History of Western Empires, Routledge, London/ New York, ISBN 978-0-415-63987-3, pp. 17–32. Innes, Hammond (2002). The Conquistadors. London: Penguin. ISBN 978-0-14-139122-9. Kirkpatrick, F. A. (1934). The Spanish Conquistadores. London: A. & C. Black. Wood, Michael (2000). Conquistadors. London: BBC Books. ISBN 978-0-563-48706-7. The Kingdom of Portugal in the 15th century was the first European power to begin building a colonial empire. The Portuguese Renaissance was a period of exploration during which Portuguese sailors discovered several Atlantic archipelagos like the Azores, Madeira, and Cape Verde, explored and colonized the African coast, discovered an eastern route to India that rounded the Cape of Good Hope, discovered Brazil, explored the Indian Ocean and established trading routes throughout most of southern Asia, and sent the first direct European maritime trade and diplomatic missions to Ming China and to Japan. Francisco Pizarro González was a Spanish conquistador who led the Spanish conquest of the Inca Empire. He captured and killed Incan emperor Atahualpa, and claimed the lands for Spain. Extremadura is an autonomous community of the western Iberian Peninsula whose capital city is Mérida, recognised by the Statute of Autonomy of Extremadura. It is made up of the two largest provinces of Spain: Cáceres and Badajoz. It is bordered by the provinces of Salamanca and Ávila to the north; by provinces of Toledo and Ciudad Real to the east, and by the provinces of Huelva, Seville, and Córdoba (Andalusia) to the south; and by Portugal to the west. Its official language is Spanish. Diego Velázquez de Cuéllar was a Spanish conquistador. He conquered and governed Cuba on behalf of Spain and moved Havana from the south coast of western Cuba to the north coast, placing it well as a port for Spanish trade. The Viceroyalty of Peru was a Spanish imperial provincial administrative district, created in 1542, that originally contained modern-day Peru and most of Spanish-ruled South America, governed from the capital of Lima. The Viceroyalty of Peru was one of the two Spanish Viceroyalties in the Americas from the sixteenth to the eighteenth centuries. Gonzalo Jiménez de Quesada y Rivera, also spelled as De Quezada and Ximénez, (Spanish: [gonˈθalo xiˈmeneθ ðe keˈsaða]; 1496 – other sources state 1506 or 1509 – Suesca, 16 February 1579 was a Spanish explorer and conquistador in northern South America, territories currently known as Colombia. He explored the northern part of South America. As a well-educated lawyer he was one of the intellectuals of the Spanish conquest. He was an effective organizer and leader, designed the first legislation for the government of the area, and was its historian. After 1569 he undertook explorations toward the east, searching for the elusive El Dorado, but returned to New Granada in 1573. He has been suggested as a possible model for Cervantes' Don Quixote. Juan de Grijalva was a Spanish conquistador, and relation of Diego Velázquez. He went to Hispaniola in 1508 and to Cuba in 1511. He was one of the early explorers of the Mexican coastline. Portuguese discoveries are the numerous territories and maritime routes discovered by the Portuguese as a result of their intensive maritime exploration during the 15th and 16th centuries. Portuguese sailors were at the vanguard of European overseas exploration, discovering and mapping the coasts of Africa, Canada, Asia and Brazil, in what became known as the Age of Discovery. Methodical expeditions started in 1419 along West Africa's coast under the sponsorship of prince Henry the Navigator, with Bartolomeu Dias reaching the Cape of Good Hope and entering the Indian Ocean in 1488. Ten years later, in 1498, Vasco da Gama led the first fleet around Africa to India, arriving in Calicut and starting a maritime route from Portugal to India. Portuguese explorations then proceeded to southeast Asia, where they reached Japan in 1542, forty-four years after their first arrival in India. In 1500, the Portuguese nobleman Pedro Álvares Cabral became the first European to discover Brazil. 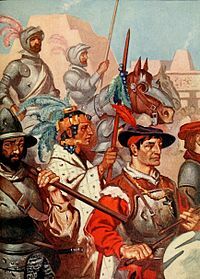 Indian auxiliaries or indios auxiliares is the term used in old Spanish chronicles and historical texts for the indigenous peoples who were integrated into the armies of the Spanish conquistadors with the purpose of supporting their advance and combat operations during the Conquest of America. They acted as guides, translators, or porters and in this role were also called yanakuna, particularly within the old Inca Empire and Chile. The term was also used for formations composed of indigenous warriors or Indios amigos, which they used for reconnaissance, combat, and as reserve in battle. The auxiliary Indians remained in use after the conquest, during some revolts, in border zones and permanent military areas, as in Chile in the Arauco War.